Presented by the Arts Center of Cannon County's Marly Berger Gallery. On display from Monday, January 18, 2010-Saturday, April 03, 2010. Do not miss this valuable opportunity to see the work of one of Tennessee's greatest photographers. These photographs, on loan from the private collection of Nashville State Community College, will not be displayed anywhere else in Tennessee. Printed from Clark's original negatives, these images pay witness to what photographers refer to as "a moment." Clark's images have an uncanny ability to reveal depth and emotion, while capturing a personal, unique second in time. On Thursday, February 18th, award-winning Tennessee photographer Bill Steber will give a lecture about Clark's life and career. A close friend of Clark's and admirer of his work, Steber's lecture will begin at 6:00 PM in the Marly Berger Gallery. This lecture is free and open to the public. Internationally recognized Life photographer Ed Clark was born in Nashville in 1911. Pursuing an early interest in photography, Clark dropped out of Hume-Fogg High School to work as a photographer's assistant at the Nashville Tennessean. For thirteen years he served as staff photographer, photographing such events as the Shelbyville riot of 1934 which destroyed the local courthouse. Clark's work attracted the attention of the new picture-oriented magazine Life, and in 1936 he began working for the publication as a stringer. A Tennessee photo opportunity came his way in 1942 when Sergeant Alvin York, famed World War I hero, registered for the "old man's draft" in Pall Mall. Clark's photo of York so impressed Life editors that they invited him to New York and hired him as a staff photographer. During World War II Clark covered the home front and later served as a correspondent in postwar Europe, covering the Nuremberg Trials. Clark's photographic exposes captured the prosperity and change of postwar America. 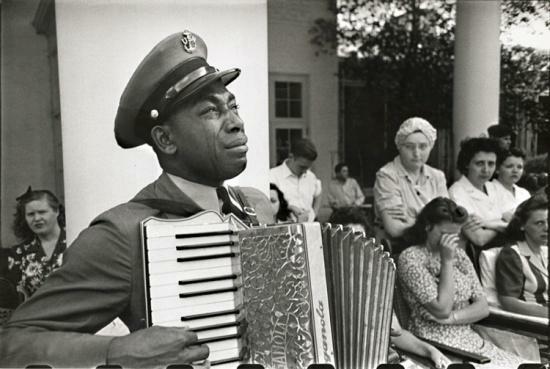 The best known Clark image is that of a grieving Graham W. Jackson playing "Goin' Home" on his accordion in honor of President Franklin Roosevelt's funeral procession in 1945. In the 1950s and early 1960s, Clark's work took him from Washington to Hollywood and around the world. He photographed Presidents Franklin Roosevelt, Harry Truman, Dwight Eisenhower, John Kennedy, Lyndon Johnson, and Richard Nixon, and such Hollywood celebrities as Marilyn Monroe, Humphrey Bogart, and Clark Gable. In 1955 an unexpected invitation to Russia gave him the distinction of being the first Western photographer in the Soviet state in thirty years. This exhibit would not be possible without the help of Nashville State Community College and the support of Five Senses Restaurant and Bar in Murfreesboro, Tennessee. Admission to this photography exhibit is free. The gallery is open 10 a.m.-4:00 p.m. Monday through Saturday. The Arts Center is located on 1424 John Bragg Highway, just west of the town of Woodbury, approximately 20 minutes from Murfreesboro, Manchester, and McMinnville and one hour southeast of Nashville. Office hours are 10:00AM to 4:00PM, Monday through Saturday. For more information pleased call 615-563-2787 or 1-800-235-9073.